This recipe is a speedier chicken version of Chile Verde, a boat or shoreside favorite when I have time to cook from scratch. However roasting chiles and tomatillos, slowly simmering chicken pieces, soaking and cooking dried beans and grilling fresh corn doesn't work when you want dinner soon... like right now... "is dinner ready yet?" soon. 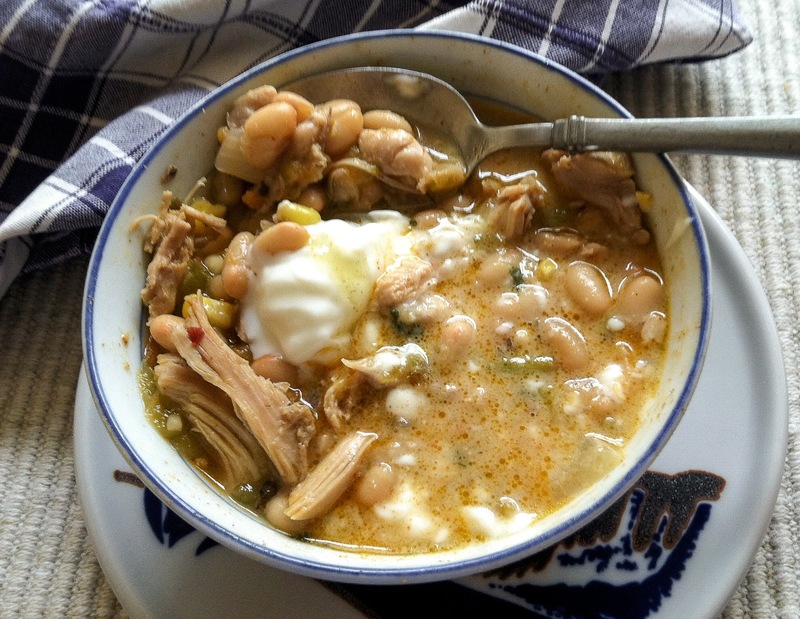 This week I pulled a container of White Bean Chicken Chili out of the freezer and looked like a hero when a quick meal was in order. I've found that the flavors mellow and deepen when the chili is cooled and reheated, a tasty bonus when making a double batch to freeze. You might want to add additional chicken broth or maybe some green taco or enchilada sauce if the chili thickens too much after a day or two in the fridge, or decide to use the thicker chili as a terrific taco and enchilada filling. Fill some crispy, store-bought tortilla chip scoops with thick chili for an easy appetizer, or griddle some cheese and chili-filled quesadillas for lunch. Yummy! 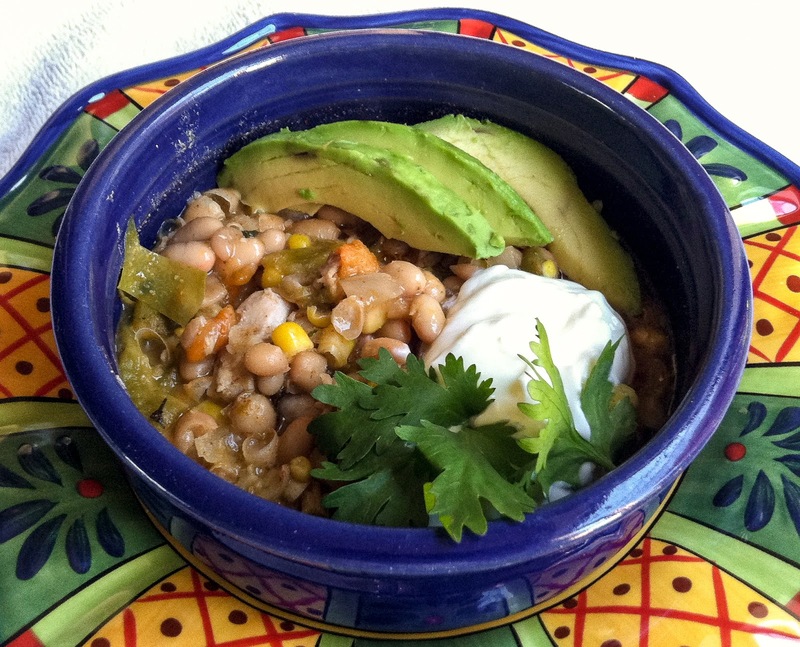 Photo: White Bean Chicken Chili topped with a dollop of sour cream and a drizzle of green enchilada sauce. What's your favorite chili recipe? I have too many favorites to pick just one, but this recipe certainly rates two thumbs up for Quick and Tasty. 4 servings, but you will want to double the recipe for tasty leftovers, or to have some to freeze. Use a medium pot and heat the olive oil. Cook the onion until softened. Add the next 6 ingredients, garlic through smoked paprika, and heat until fragrant. Toss in the chopped chiles and shredded chicken, turning to coat all with the spice mixture. Cook for a few minutes, adding more olive oil if the pot begin to dry out. Add the corn, beans, and 2 cups of chicken broth to the pot; bring to a boil. Reduce the heat and simmer, partially covered, for 10 minutes. Taste and adjust seasonings to taste, adding salt and white pepper if desired. Mash some of the beans to thicken the chili somewhat. Stir in the crema, if using, and add more chicken broth if you want a soupier chili. Let the chili sit to blend the flavors, reheating gently to serve with a variety of toppings. Like so many other soups and chilis, this chili will thicken and develop a deeper, more mellow flavor after an overnight rest in the fridge. Adding a few Tablespoons of lime juice or green enchilada sauce to the pot offers a popular flavor adjustment. Add more broth for a looser mix to create a delicious southwestern soup. Serve the chili over cooked rice or potatoes for a heartier dish. Today marks the official start to Summer 2017 and there's cause to celebrate; strawberries abound at our local farmers' markets and TV weathercasts predict warm, sunny days for the rest of this week. Weather forecasts aside, freshly picked berries can brighten any day with their distinctive floral aroma, and sweet/tangy bursts of flavor. No doubt about it, in-season strawberries sing "Summer!" and will brighten a variety of dishes. 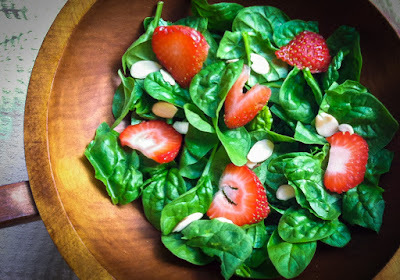 Strawberry/spinach salads rank high on my list of favorite June lunches. 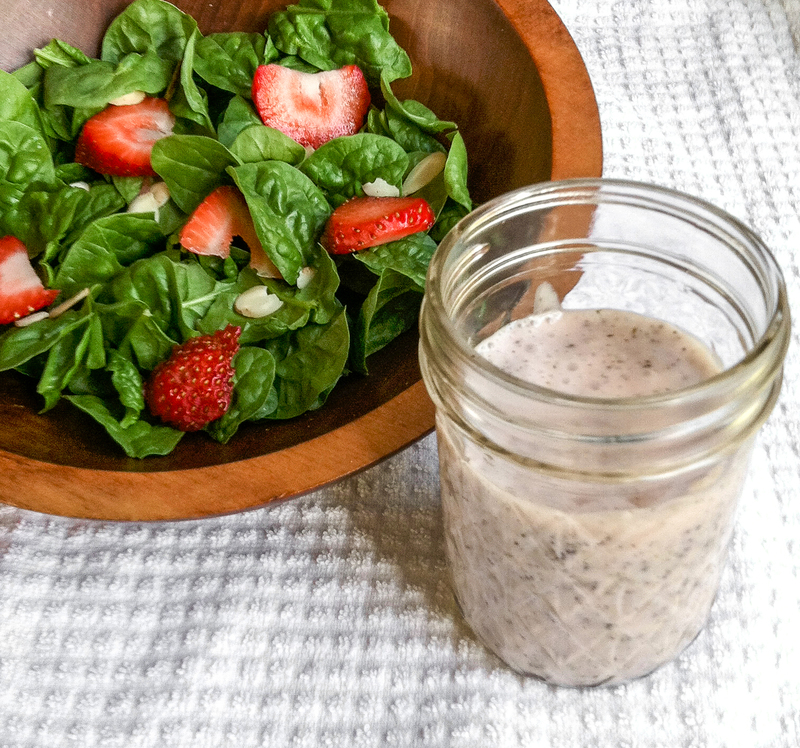 A recent salad bowl featured my version of Poppyseed Dressing, a trial-and-error experiment that I'll definitely make again. 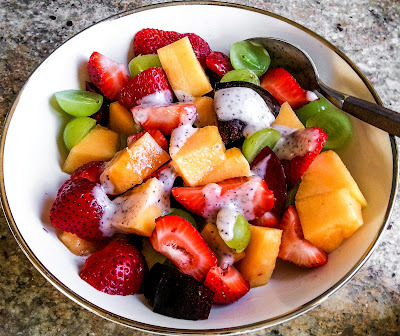 The same Poppyseed Dressing was delicious with a mixed bowl of fruit featuring strawberries (of course), plums, cantaloupe and grapes. 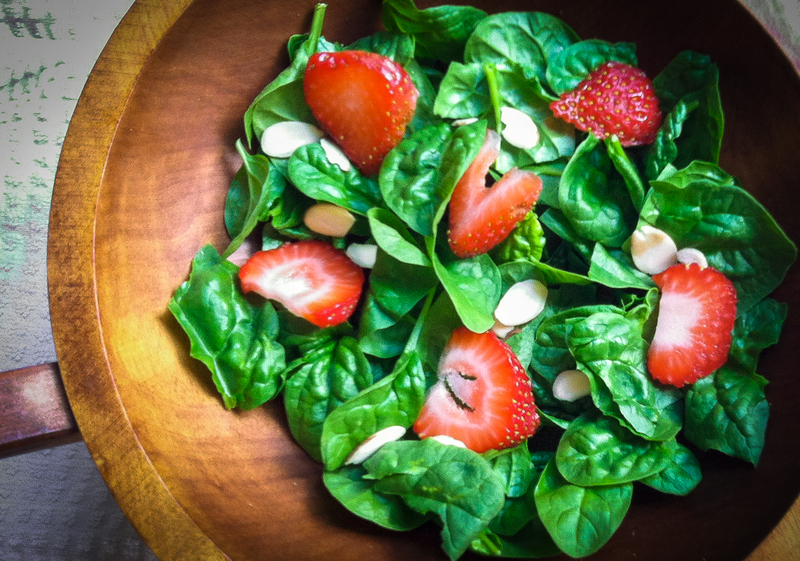 The dressing highlighted the individual flavors of the fruits without masking or overpowering the various tastes. More of the same sauced fruit won raves as a perfect waffle topper, along with a portion of cottage cheese. 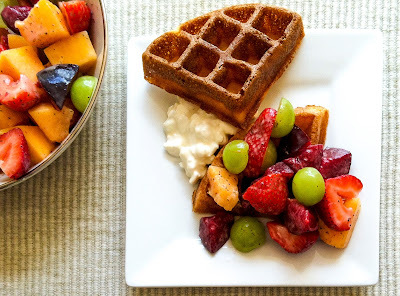 Forget the maple syrup and butter and pile your waffles with Poppyseed Dressing and fruit... really! This dressing might not win any awards for appearance, but it does merit high marks for taste and versatility. 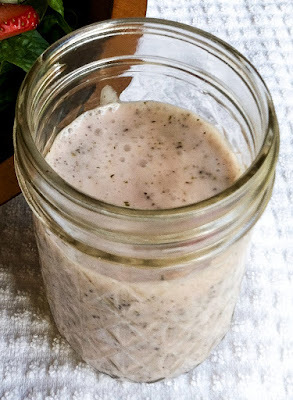 Blend together (with blender or a whisk and small bowl) the honey, vinegar, dry mustard, and mayonnaise. Add half of the oil in a very thin stream while blending or whisking. Check the consistency; add the remaining oil as desired to thicken slightly. Note: this will be a very loose dressing. Stir in the mint and poppyseeds. Taste; add salt if desired (I don't). Inspired by a photo in Diana Henry's cookbook Simple, one lone sweet potato hanging out in the crisper became 'Breakfast for Dinner'. 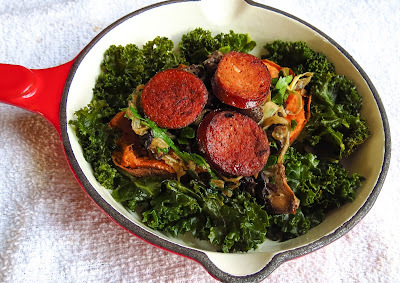 Containers of caramelized mushrooms and braised kale already lurked in the fridge along with several links of chorizo sausage, making this a quick cook. 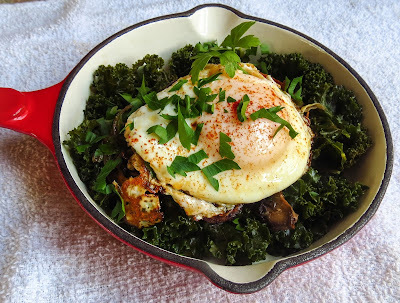 The recipe called for an accompaniment of baby spinach leaves, but the earthy bite of braised kale better balanced the potato's sweetness and the mushrooms' savory umami. Topped with a soft-yolk cooked egg, each bite was an ooey-gooey, savory-sweet delight. This deceptively simple, boldly flavored dish was nearly effortless to construct, reflective of Henry's desire to offer a book of low-effort food ideas. "What we mostly lack are ideas. That's what I tried to give... here. You don't have to be a chef. I'm not. You just need some inspiration to help you turn the ordinary--the building blocks of meals--into something special." 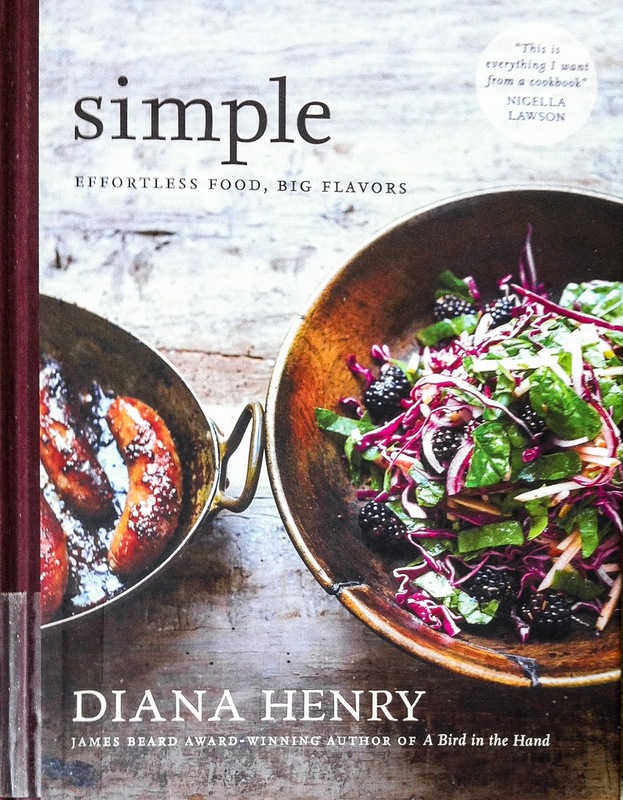 Simple inspiration comes through text and photos, most of Henry's recipes offering suggestions of alternate ingredients, plating notions or food pairings. 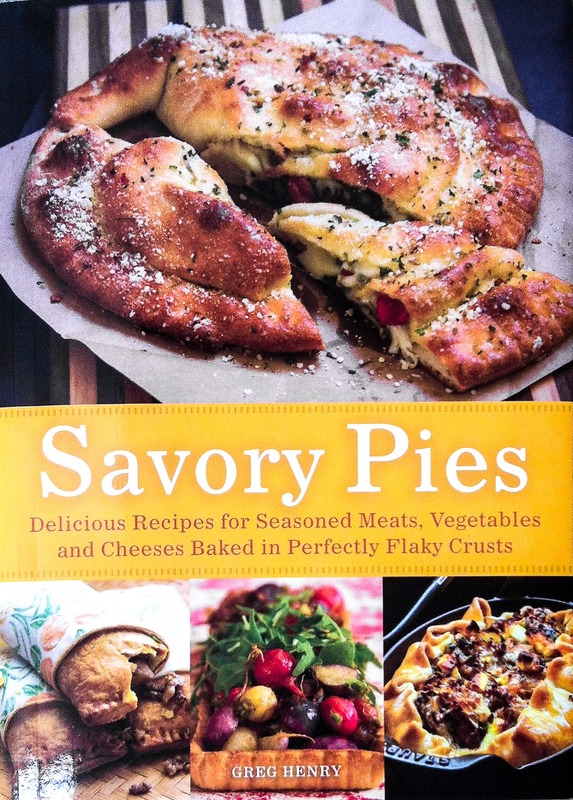 So far I have played with recipes in chapters on Toast, Pasta & Grains, and Vegetables, adapting each to suit our palate and available ingredients. 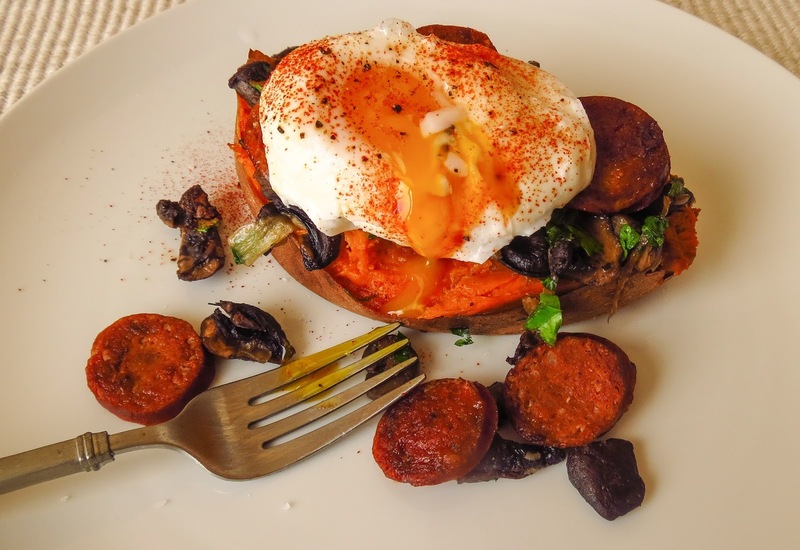 Loaded potatoes are nothing new, but this loaded sweet potato was indeed 'something special', perfect for any time of the day, even Breakfast for Dinner. 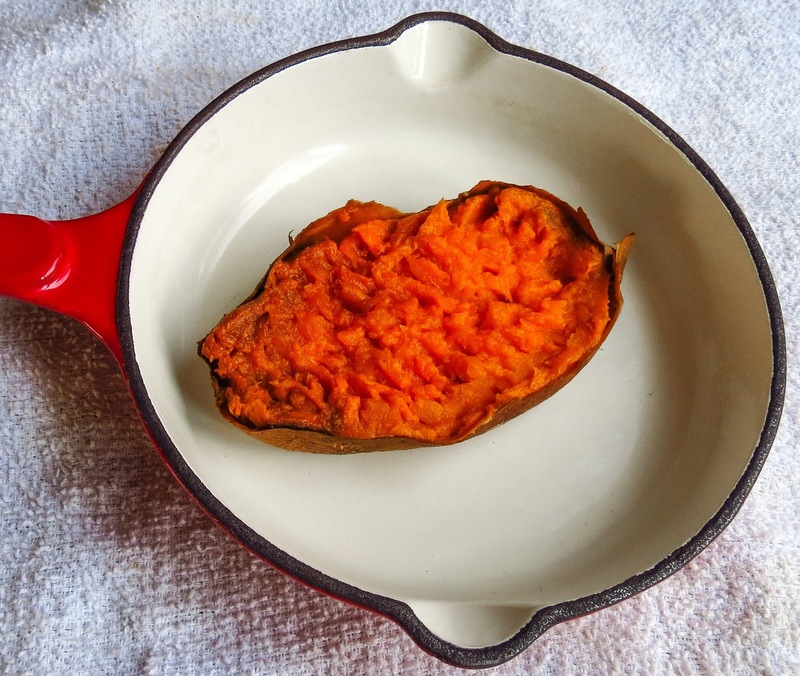 Bake or microwave a sweet potato in your regular manner. Split lengthwise and squish slightly to open up the inside (I sliced lengthwise into halves for 2 portions). Place on serving dish. - Heat butter and/or olive oil in a saute pan; add mushrooms (cut into thin wedges or slices) and cook until they give up their juices; continue cooking until liquid evaporates. - Heat olive oil in a large saute pan over medium-high heat; add 3 cloves of garlic and 1/4 cup diced onion and cook until soft. 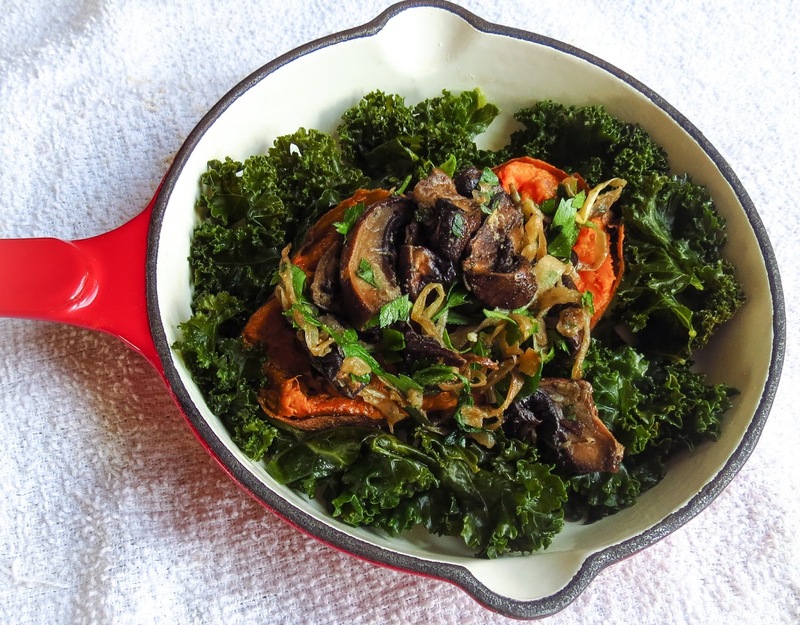 Add 1/2 bunch of destemmed lacinato kale, coarsely chopped and 1/2 cup stock or water. Toss to coat greens, then cover and cook until softened and wilted, about 5 minutes. Remove cover and cook until liquid evaporates. Toss with a heavy splash of balsamic vinegar, salt and pepper. Top the cooked sweet potato with a generous amount of the mushrooms and kale. Add cooked coins of chorizo, or your favorite spicy sausage. 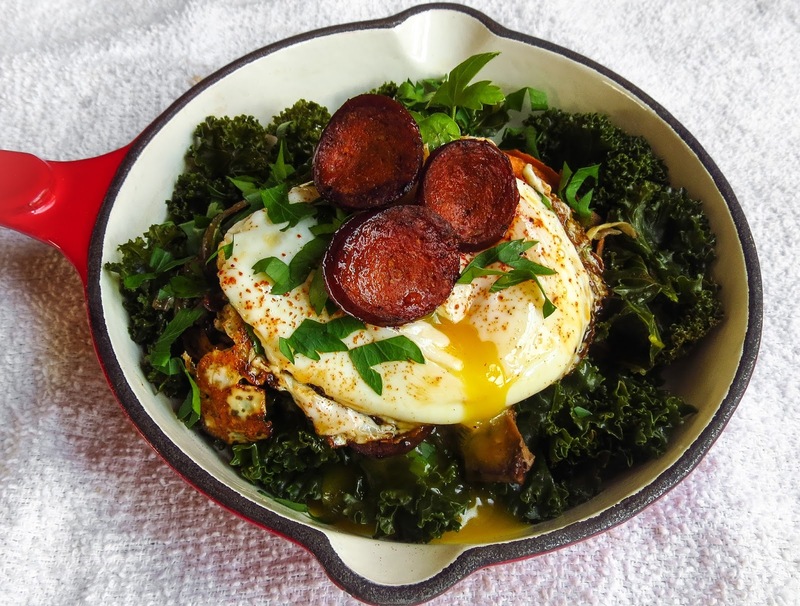 ...and this egg was poached. Mmmmm, good either way. It's that time again! 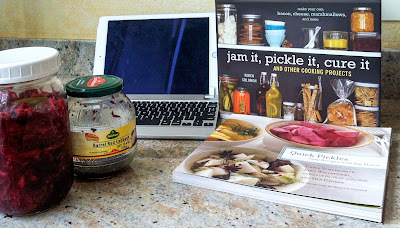 time to see what's new with kitchens and cooks all 'round the globe via the links found at Sherry's Pickings. 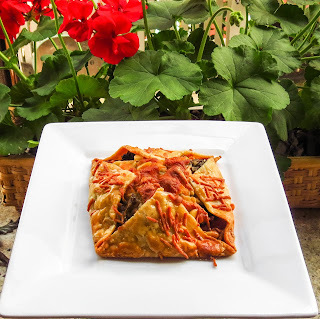 Currently hosted by Sherry, an active food blogger in Brisbane, Australia, this monthly IMK event is not to be missed whether you link your own post or just enjoy reading the notes from other cooks. 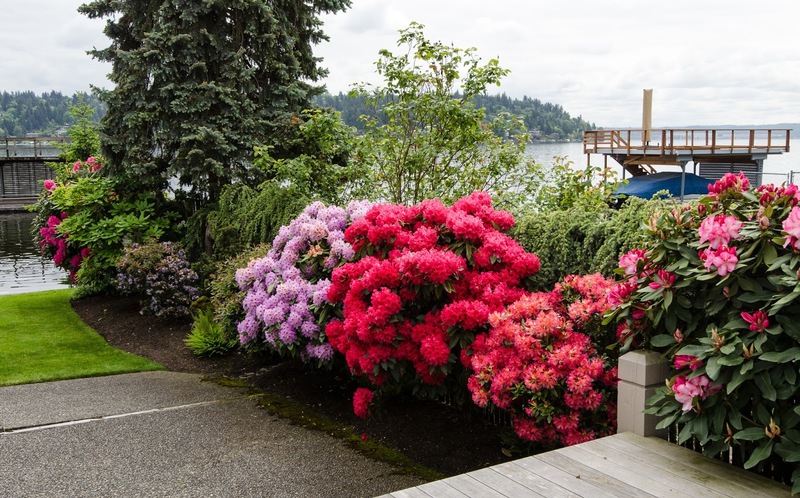 ...Spring blooms transform the view from the kitchen windows, something to appreciate when gray days linger on, so I'm reluctant to cut too many for indoor display. 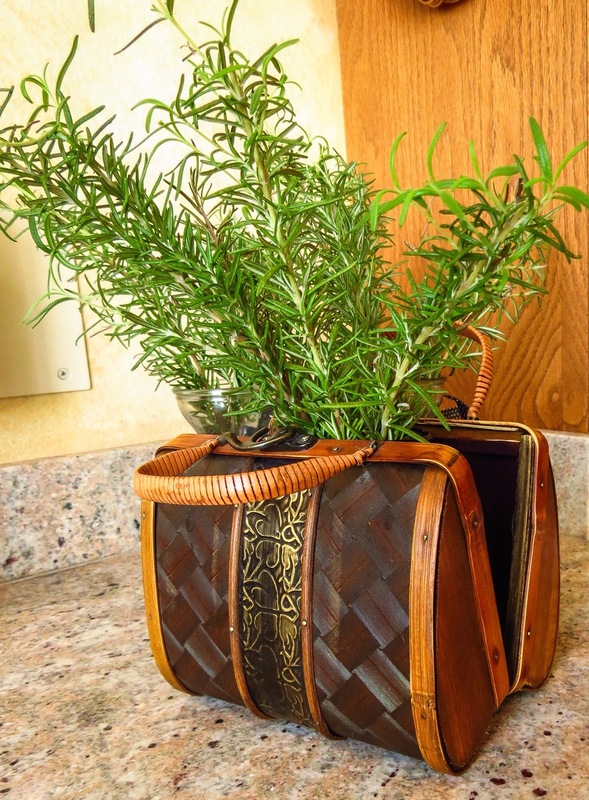 Instead, you'll find odd containers repurposed as vases to hold herbs and miscellaneous greenery. Rosemary roots readily, and often moves outdoors to fill empty spots in the southside flowerbeds, so I don't mind cutting it. Now I'd better get busy planting some colorful annuals along with a few veggies; with any luck the local ducks and geese will eat the slugs and not the tender plants. ...friend Charlene sent me this bragging apron, just because. BFF Char is my oldest friend, not in age but in length of friendship, and we have had decades of cooking adventures together. Some of the more memorable events may have included a lot of wine (for the cooks if not for the recipes). 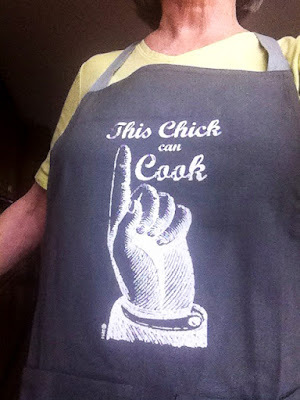 Swipes of flour and dough down the sides of my jeans remind me that aprons are useful, functional items only when worn. Sigh. ...I have been a lazy cook while RL traveled, existing on fresh fruit, light snacks, and an occasional lunch out. 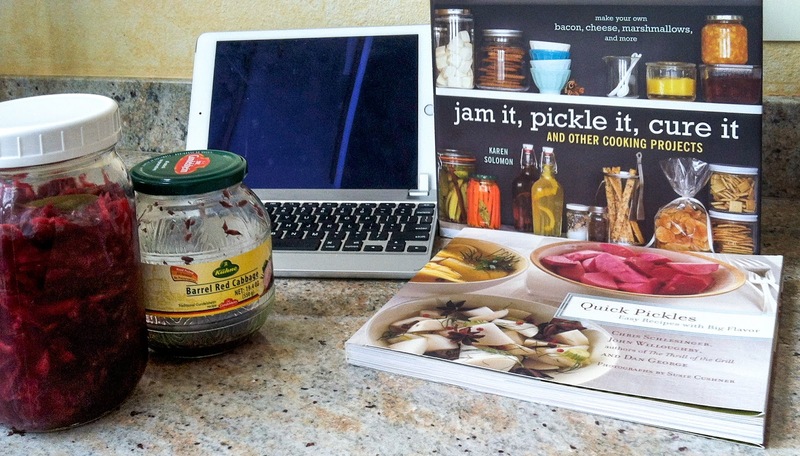 Then foodblogs and cookbooks nudged me back into action. Several IMK cooks have recommended recipes from Diana Henry, a British cookbook author previously unknown to me. The local library had her A Bird in the Hand available for checkout; I skimmed it but meh! wasn't thrilled. A newer Henry cookbook, Simple, sounded more promising, so I became number 57 on the reserve list. It was worth the long wait. 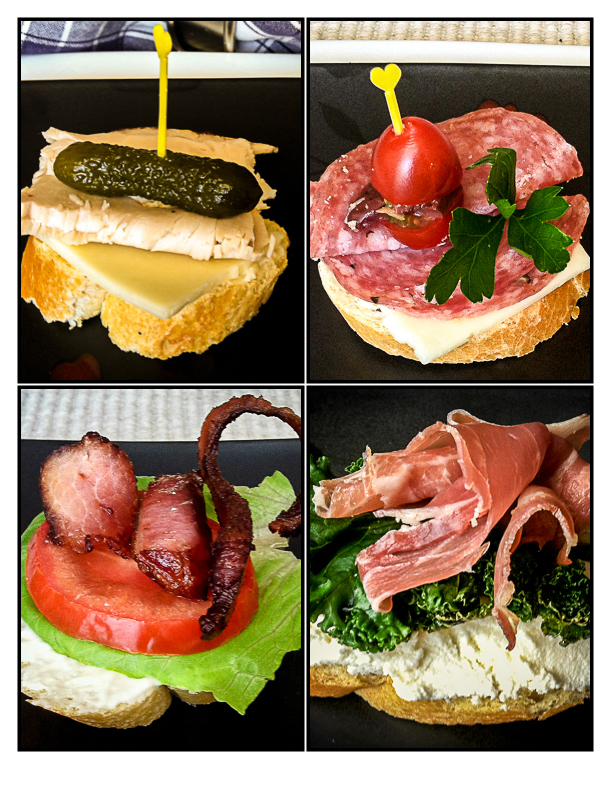 I began by exploring some of Henry's meals for one - Toast Toppers. Success, and a lot of fun creating my own variations. Now I'm eager to try some of the many other Simple recipes I've marked with PostIt notes. Recent adventures with savory asparagus hand pies spurred renewed interest in this rediscovered little cookbook, a resource for inspiration if not actual recipes. Pie crust skills still terrify elude me, but frozen premade dough removes the intimidation factor. It's strange that breadlike pizza, calzone and stromboli seem effortless, but rolled pastry anything is daunting. Hmmmm I might be missing the pastry gene. 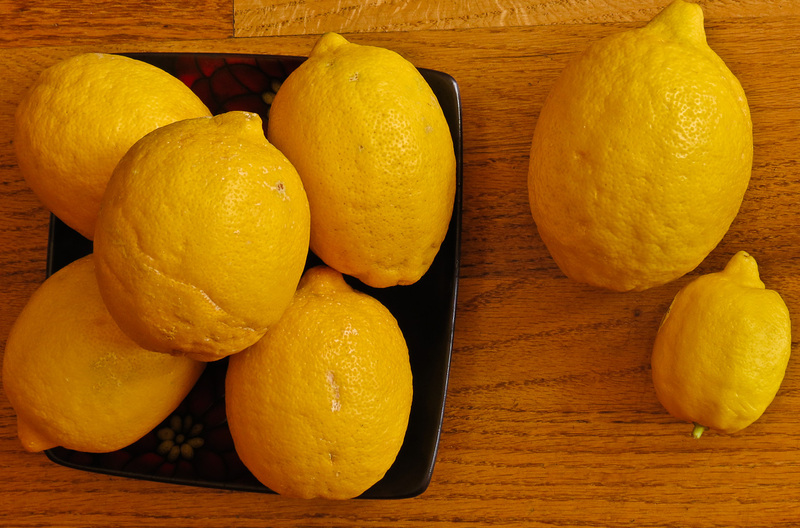 Tanya shared some enormous lemons from her yard in Yuma, Arizona. They are super juicy with incredibly aromatic zest; special treats from a special friend. 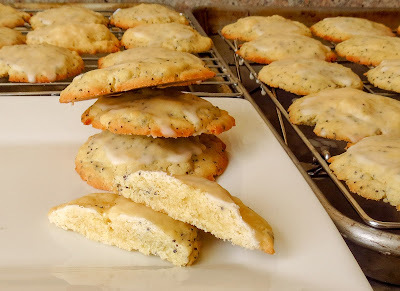 Lemon Poppyseed Cookies disappeared rapidly when I shared several dozen with a group of medical professionals. I'll credit the lemons, and the appetites at UWMC for this success. 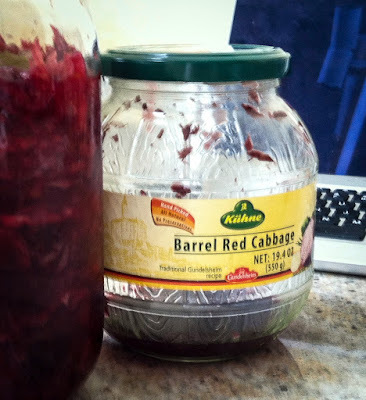 RL returned from the boat with an empty food jar, requesting a homemade version of his newly discovered favorite food. Ja, right. I'm on batch #3 and haven't quite matched the flavor yet, but each attempt has been... well, interesting. Think Goldilocks progress: #1 was too sour, #2 was too sweet, so it follows that #3 should be "just right". Right? Na. 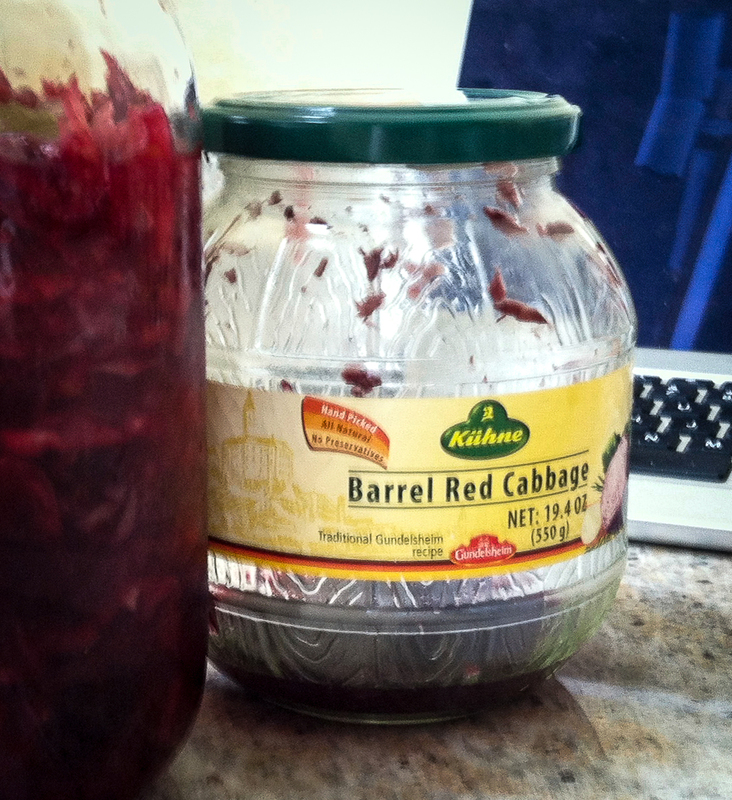 If only my Austrian Mom and Grandma had recorded their red cabbage recipes. 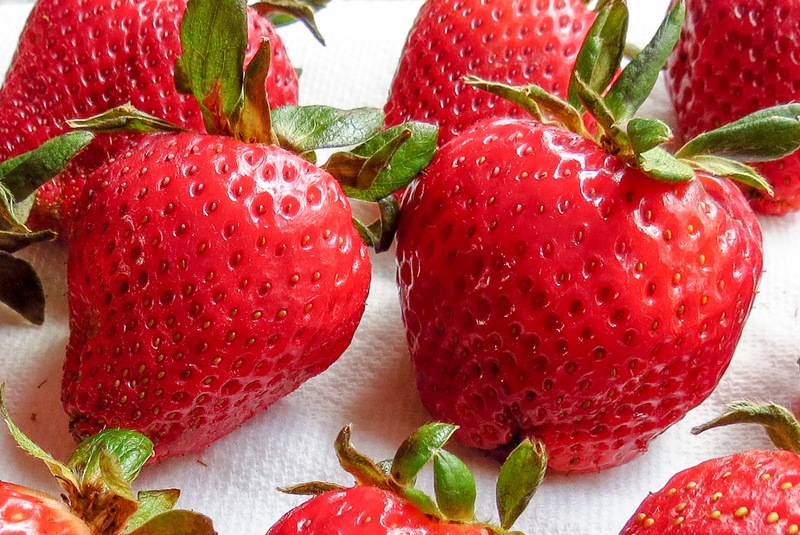 Now that official summer is mere weeks away, it's time to seek out some fresh local rhubarb, sweet strawberries and more asparagus and get cooking. Maybe it's time to whip up that batch of Moscow Mules that didn't work out earlier. (link) What's happening in your kitchen? When life gives you lemons... bake cookies! Once again girlfriend Tanya gifted me with a bagful of gigantic lemons from her tree in Yuma. 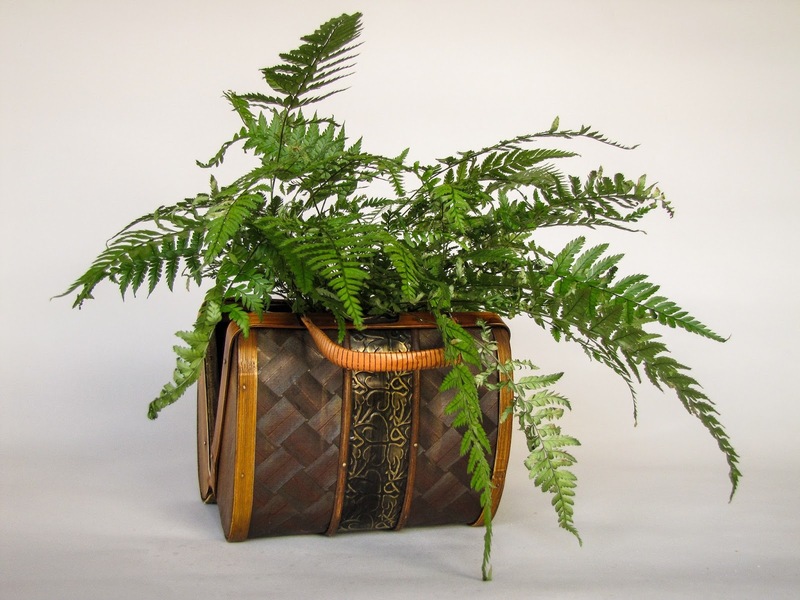 Besides smelling divine, these juicy monsters yield oodles of zest - perfume with a purpose. Ooooh, the possibilities; lemon cookies, lemon cakes, lemon sauces, Hollandaise of course, fresh lemon zest in everything... No contest! 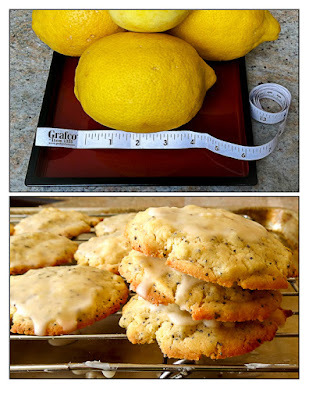 Let's celebrate Spring-almost-Summer with a batch of lemon cookies. RL was out of town and I never rarely bake cookies just for myself, so this first, experimental batch was purposed as a thank you treat for a medical office crew I've visited lately. An upbeat, supportive group of professionals, I expect them to sample with enthusiasm and provide honest feedback on taste and texture. Lemon sugar cookies, dropped not rolled, sounded sunny and flavorful but I turned to some online resources to fine tune the recipe. A Cooking: NYTimes post for Basic Sugar Cookies did cover the basics, but I wanted more flavor "pop" to highlight the essential lemonyness. Lemon Sunshine Cookies at Serious Eats made claims to "melting away on your tongue into a burst of lemon". Yeah, that's more like it, and a dip in a lemon glaze upped the sweetness factor. This recipe had possibilities, but I kept searching. One of Tanya's Arizona lemons, plus a couple of tablespoons of poppy seeds, transformed ordinary sugar cookies into soft, sweet, lemony bites of sunshine. Thanks to Maria and Josh for posting the recipe. Now I can't wait for the taste test feedback. I will update soon. 6/5/2017 update: the cookies were a major hit with the clinic staff (plus a few incidental other folks who heard there was food in the break room). 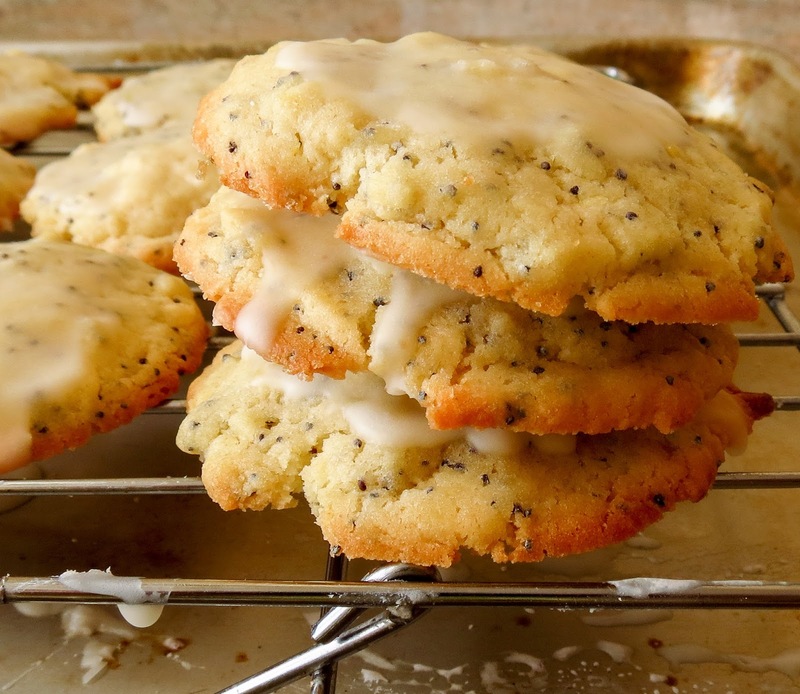 Two dozen Glazed Lemon Poppy Seed Cookies and three dozen Cruising Cookies tied for "favorite cookie" honors. I consider that a baking success. Preheat the oven to 350 degrees F. Use parchment paper or a silicone baking mat to line 2 insulated cookie sheets. Set aside. Sift flour, baking powder and salt into a small bowl. Whisk and set aside. In another small bowl, blend together the sugar and lemon zest. Use an electric mixer, stand mixer or handheld, and beat the softened butter and lemon zest/sugar mixture together at high speed until light and fluffy. Add the eggs, lemon juice, vanilla and lemon extract; mix until smooth. Add the dry ingredient mixture; use low speed and beat until just combined. Stir in the poppy seeds by hand. Drop walnut-sized blobs of dough onto the prepared baking sheets, placing them roughly 2-inches apart.